Tumalo Art Co. was included in a story by KTVZ about our participation in Bend’s Joy Project. Check out the story! A sampling of several artists booths in our Best Fine Art Sale Ever. 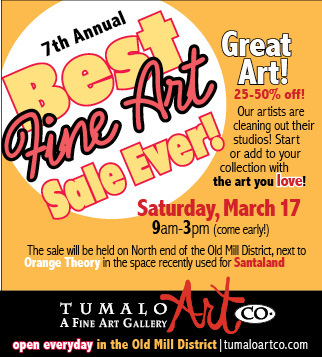 The 8th Annual, Tumalo Art Co., Best Fine Art Sale Ever is slated for Saturday, March 16, from 9am-3pm, right next to Desperado in Bend’s Old Mill District (last year’s Santaland space). 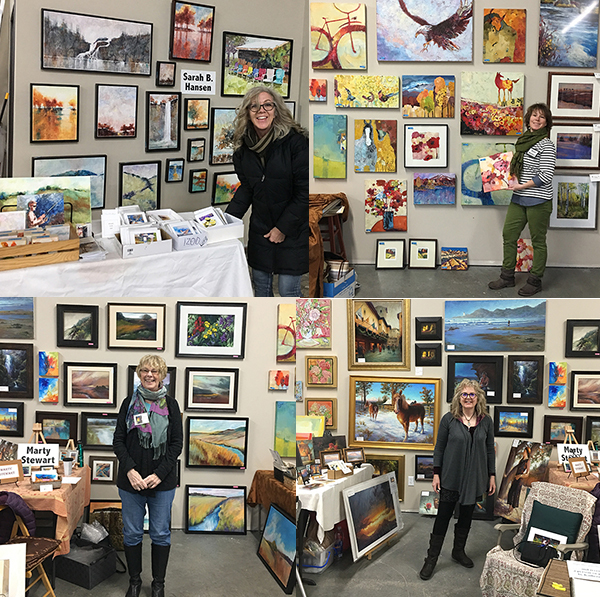 This once a year sale, where artists clear out their studios to make way for a new year of art-making, has become an anticipated event by Central Oregon art lovers. Nearly 20 artists will be involved, all who currently show or have shown, at Tumalo Art Co., an artist-run gallery located in the heart of the Old Mill District. There will be a diverse selection of art available, from paintings in all media and sizes, digital media, glass, wood-turning, jewelry and more. Come early to get the best selection. For more information call 541-385-9144. Tumalo Art Co. is launching their Artists in Action event July through September. 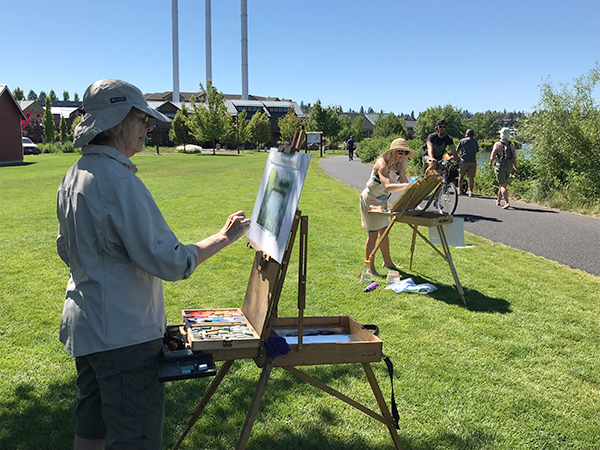 Artists will be painting plein air nearby in the Old Mill District and demonstrating both inside and outside the gallery two Thursdays a month, beginning with July 12 and 26 from 10am to noon. The three-month series will culminate with an October show exhibiting the art created during the event. Susan Luckey Higdon, Sarah B. Hansen and Marty Stewart will be painting plein air. Danica Curtright will be demonstrating making Moretti glass beads for her jewelry both in the morning and from 4-6pm. Helen Brown will demonstrate her watercolor batik technique. Dorothy Freudenberg will give an artist talk about digital media at 10:30 am. Judy Hoiness and Mary Marquiss will be painting outside the gallery. Susan Luckey Higdon and Marty Stewartwill be painting plein air. Dorothy Freudenberg will present an artist talk at 10:30 am. Please come by the gallery and enjoy the art both inside and outside the gallery. Lori and Lisa Lubbesmeyer and Nature Inspired will also be participating so be sure and stop by on the Thursday mornings noted here, from 10-noon! Our 7th Annual Best Fine Art Sale Ever will be March 17, from 9-3 pm. This year we are back in the Old Mill District in the space next to Orange Theory that was recently used as Santaland. Previously the Orvis building. This studio sale with 20 of your favorite artists is a must for art lovers! Artists are reducing their prices as much as 50% to make room for new art. The Fall season of Alisa Huntley‘s Art Classes for Children, 1st-5th grade, begins at Wabi Sabi in downtown Bend (Tuesdays, Sept 12-Nov. 28) and the Unitarian Church (Thursdays, Sept. 14-Nov. 30). Projects include mechanical animal drawings, batik Halloween bags, elaborate paper-mâché animal masks, and crazy water color sheep or llamas. Call Alisa at 541 948-9346 to register and for more information. Janice Druian will be one of the artists showing at theFavell Museum Juried Art Show & SaleSeptember 15, through October 28, 2017. The 2017 show will open with an artist weekend September 15-17, beginning with a Friday evening ticketed reception, a full day of demonstrations and attractions on Saturday and culminating with a Sunday champagne brunch. The Favell Museum in Klamath Falls has a 43-year tradition of supporting and promoting exceptional artists! Helen Brown’s show My Journey with Lewis and Clark runs September 15, 2017 through January 14, 2018 at the Oregon Historical Society in Portland. It opens with a reception September 14, from 5:30-7:30. RSVP to attend. Last year, Helen began her Lewis and Clark series with a well-received show at Tumalo Art Co. She has expanded on the series, creating an exhibit that includes 31 watercolor batik paintings depicting aspects of the expedition—”a subject that has become dear to my heart”, says Helen. Our 7th Annual Best Fine Art Sale Ever will be March 17, from 9-3 pm. Location is not confirmed yet, but stay tuned, there will be lots of info out in a few weeks.studio sale with 20 of your favorite artists is a must for art lovers! Our original date of February 25 was changed due to losing our location. We are sorry if this causes an inconvenience. 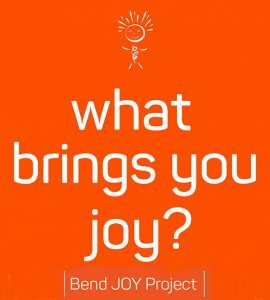 Tumalo Art Co. artists are creating an installation outside the gallery with the community answering the question “What brings you joy?” for the Bend Joy Project during February. Orange tags and waterproof pens are provided for people to answer that question, by drawing or writing. Hanging the tags will create an interactive art show and share the joy! This dovetails with the February Group Still Life show, The Joy of Everyday Things. Multi-skilled artist, David Kinker has been selected to be on a three person snow sculpting team for the Portland Sapporo Sisters City Association. The team will be traveling to the Sapporo Snow Festival in Japan, February 4-11, where as many as 14 teams from around the world make over 300 snow sculptures.This years theme for the Portland team will be “Roses from Portland”, carved from a 12-foot block of snow. In addition to sculpting, the team members will be giving art lessons to local school children and others both in Japan and Portland. Uncommon Valor, a watercolor batik on rice paper, by Helen Brown, was accepted by nationally known juror John Salminen for the Southern Arizona Watercolor Guild Annual Show. Helen will travel to Tucson to take part in the exhibit and attend the Salminen workshop for 5 days. Janice Druian‘s painting, Desert Light, was accepted in the Mountain Oyster Club’s 45th Annual Contemporary Western Art Show and Sale in Tuscon AZ, November 23, 2014. Paul Alan Bennett has designed a backdrop for the stage at the new Fir Street Park performing area in Sisters, OR. The black powder-coated aluminum Song Bird Tree will be 5.5′ tall by 6.5′ wide.The Song Bird Tree celebrates Sisters as a Tree City and was also used in the 2014 Sisters Folk Festival in one of their outdoor venues. David Kinker has finished the 60′ mural he has been working on all summer in Maupin, OR, (detail above), and has been commissioned to create a mural in a private residence at Brasada Ranch. Kathy Deggendorfer‘s exhibit at the High Desert Museum—Painting Oregon’s Harvest, opened August 28 to a large crowd. HDM added instructive displays about Oregon’s artisan agriculture. For the last several years Kathy has been traveling Oregon capturing scenes in her sketchbook, then creating full-size paintings in her studio. A Harvest Dinner, October 4, will showcase regional ingredients from many of the farms and ranches featured in the exhibition. Prepared by Chef TR McCrystal of Jen’s Garden, the meal will be paired with Oregon wine. The exhibit runs through November 30. Helen Brown‘s painting Villa Garden was just selected Best of Show at the current Roberts Field show Through the Garden Gate. Helen painted the piece from a photo she took while in Italy earlier this year. The exhibit will be up at the Redmond Airport until October 5. Gill Dellinger has been Invited to participate in the Greenbrier Resort Fine Art Week paint-out in West Virginia October 20-26 with 15 artists from around the country. Gill Dellinger painted recently in the rain forest on the Olympic penninsula and Glacier National Park. He won Best of Show at the Sisters Country Fair and will be the juror for the Umpqua Valley Arts Association 2014 Umpqua Plein Air event September 10-13. Janice Druian and Danae Bennett Miller have been invited to the Favell Museum Invitational Art Show & Sale showcasing contemporary, representational art from more than 30 acclaimed West Coast artists. A variety of subject matter and styles will be featured, in oil, pastel, acrylic, watercolor, bronze sculpture, wood sculpture and more. The month long show will begin with a two day reception September 27-28. Both Saturday and Sunday morning watch plein air painting, sculpting, and more, in the museum garden. The art produced will be part of a weekend-long silent auction. Janice Druian, Gil Dellinger and Marty Stewart were juried into Art of the West, a show of contemporary western art in conjunction with the High Desert Rendezvous fundraiser August 23. Central Oregon Magazines annual Reader’s Choice section. Thank You! Together with his wife Carolyn Platt, Paul Alan Bennett has finished painting two murals outside of the Strictly Organic coffee shop in the Old Mill District. After some thought about the people and pets that frequent the area, Paul decided that a mural showing different breeds of dogs would be a great theme for one wall. The other wall, shown above, features the river running through the area. Paul’s mural designs in the underpasses on the river path are enjoyed immensely. Stop by and watch the progress! Marty Stewart was awarded 2nd Place and a prize of $200 in the 2nd Annual Smith Rock Paint Out, June 21. The event is sponsored by the High Desert Art League and Smith Rock Park Service. Marty’s pastel painting, Smith Rock in Sage Dressing, along with 24 other paintings from the event, are being displayed in a show at the Redmond Airport, through August 17. Janice Druian‘s painting is also in the show. Susan Luckey Higdon‘s artwork Terrebonne Stroll is the signature art for the Deschutes River Conservancy‘s annual Riverfeast event August 2, celebrating the role the Deschutes River plays in the bounty that is harvested in this region. Shelli Walters is the featured artist for the June issue of Cascade A&E. Her Flamenco Dancer No5 (shown above) is on the cover and an article about Shelli and her artistic process is found inside. The Cascade A&E is available throughout Bend and at the gallery. Kathy Deggendorfer has installed her tile mural in the new St. Charles Cancer Center in Bend, Oregon. The 72 piece mural features 12″ tiles, spans 24 ‘and is a panoramic of the Cascade mountains. There will be a grand opening in August. Watercolorist Annie Ferder is turning her finely detailed brushwork to the western genre. Reproductions of her ranch still life are available at Tumalo Art Co. where the original is hanging this month. Tracy Leagjeld has been invited to show a monotype in “The Art of Wilderness” celebrating the 50th anniversary of the Wilderness Act. It will be held at Lava Lands information center for one week opening June 27, and is sponsored by Discover Your Forest, a stewardship non-profit for the Deschutes and Ochoco National Forests, and the Crooked River National Grassland. Lindy Gruger Gaskill created a commissioned painting and cd design for L.A. Jazz Flutist, Rumi Flute. Contact the gallery at 541-385-9144 if you would like your own commissioned painting. Many of the artists at Tumalo Art Co. will create a commissioned painting especially for you! Tracy Leagjeld won a Second Place award at the Working Waterfront Coalitions, Industry & Art: Celebrating the Worker juried show for her three monotypes, at Viro’s Shipyard on Swan Island, Portland, OR. Alisa Huntley had 2 pieces accepted into the Portland Art Museum Rental Gallery—Grace and Beauty and Glorious —for their fall 2012 show. Tumalo Art Co. is now showing large art works at Jackalope Grill in downtown Bend. We are pleased to have put up lots of large art in this wonderful space, giving us extra room to showcase these pieces. The owners gave us an open ticket to do it the way we felt would look best and the results are stunning if we do say ourselves! The food is amazing and the space is lovely. The art is for sale so customers may contact the gallery regarding purchasing. Janice Druian’s painting, “Before the Rains Came,” was awarded Best In Show for her plein air painting at the annual Los Gatos Plein Air Show. 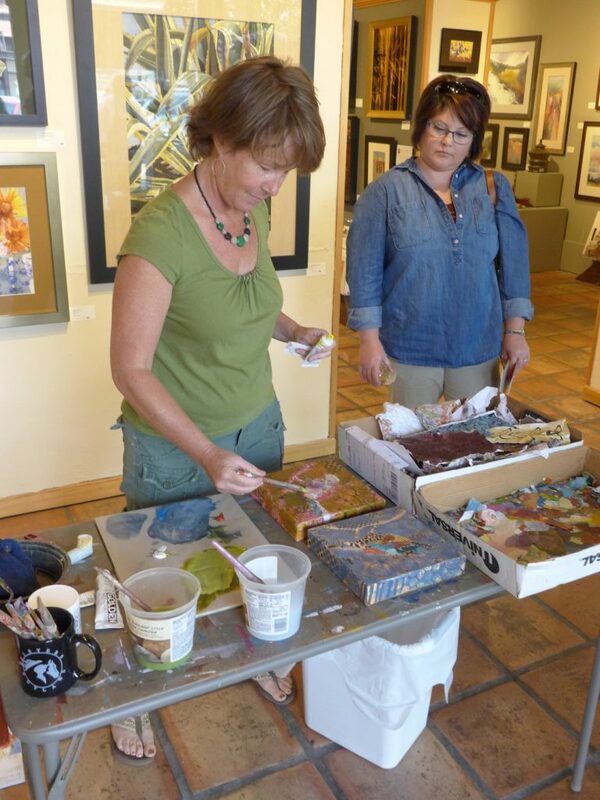 Juried artists had three days to plain from locations around the Los Gatos area in California. The challenge this year was to find a time when it wasn’t raining! More than 100 original works of art from 35 nationally recognized, award-winning artists were on display. These artists use oil, watercolor, and pastels to paint in the ‘en plein air’ tradition created by the Impressionists. the artists at the gallery.